Overall, a median of 64% across 32 emerging and developing nations say the internet is a good influence on education, with at least half also seeing it as a good influence on personal relationships (53%) and the economy (52%). People are more mixed on the internet’s effect on politics, with similar proportions saying that the influence is good (36%) as say it is bad (30%). Publics in emerging and developing nations are more convinced that the internet is having a negative effect on morality. 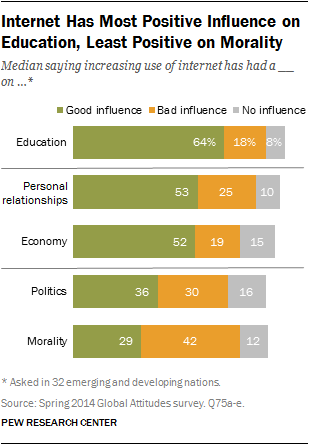 A median of 42% say it is a bad influence on morality, while only 29% see the internet as a good influence. And in no country surveyed does a majority say that the internet’s influence on morality is a positive. However, many in these emerging and developing nations are left out of the internet revolution entirely. A median of less than half across the 32 countries surveyed use the internet at least occasionally, through either smartphones or other devices, though usage rates vary considerably. Computer ownership also varies, from as little as 3% in Uganda to 78% in Russia. But accessing the internet no longer requires a fixed line to a computer, and in many nations cell phones are nearly universal, while landlines are almost unheard of. In some countries, such as Chile and China, smartphone usage rates are comparable to that of the United States. Internet access and smartphone ownership rates in these emerging and developing nations are greatest among the well-educated and the young, i.e. those 18- to 34-year-olds who came of age in an era of massive technological advancement. People who read or speak English are also more likely to access the internet, even when holding constant other key factors, such as age and education.1 Overall, across the countries surveyed, internet access rates are higher in richer, more developed economies. Once online, internet users in emerging and developing nations have embraced socializing as their most preferred type of digital activity. Majorities of internet users in all countries surveyed with large enough sample sizes to analyze say they stay in touch with friends and family online. Many also use cyberspace for getting information about politics, health care and government services. Less common are commercial and career activities, such as searching or applying for a job, making or receiving payments, buying products and taking online classes. Social networkers in these countries share information on popular culture, such as music, movies and sports. To a lesser extent, they share views about commercial products, politics and religion. Regardless of what internet users choose to do online, most in these emerging and developing countries are doing it daily. These are among the main findings of a Pew Research Center survey conducted among 36,619 people in 32 emerging and developing countries from March 17 to June 5, 2014. All interviews were conducted face-to-face. Comparison figures from the U.S. are from a Pew Research telephone survey conducted April 22 to May 11, 2014, among 1,002 people, unless otherwise noted. A clear majority of people in these emerging and developing countries see the internet as a positive influence on education. A median of 64% among the general population (including non-internet users) in the 32 emerging and developing nations surveyed say the internet is a good influence on education. People are also keen on the internet and its influence on personal relationships (53% good influence) and the economy (52%). Few people say that the internet has no influence on these aspects of life. Publics are less enthused about the internet’s effect on politics. A median of just 36% say it is a positive for their country’s political system, while three-in-ten say it is a bad influence. People are even more leery of the internet’s effect on morality. A median of only 29% say the internet is a good influence on morality, while 42% say it is a bad influence. These sentiments are fairly constant across the countries surveyed. Generally, people who have access to the internet are more positive about its societal influence. For example, 65% of internet users in these emerging and developing nations say the increasing use of the internet is a positive for personal relationships, while only 44% of non-internet users agree. Similar gaps appear on the positive influence of the internet on education, the economy and politics. 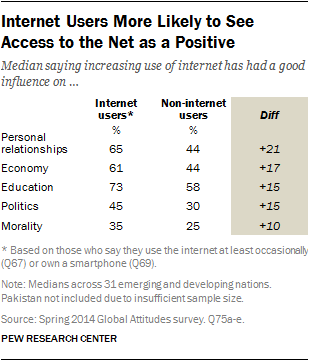 Highly educated respondents are also more likely to say the internet is a positive influence. Six-in-ten of those with a secondary education or more say the increasing use of the internet is a good influence on personal relationships, compared with 44% among people with less education. Even as general publics see the influence of the internet increase in their everyday lives, there are still many people without access to the internet in these emerging and developing countries. Across the 32 nations surveyed, a median of 44% use the internet at least occasionally, either through smartphones or other devices. 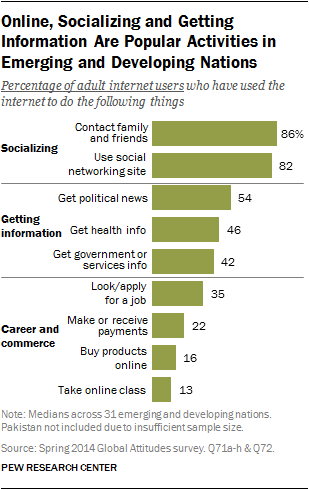 Comparatively, as of early 2014, 87% of adults in the U.S. use the internet, according to Pew Research Center studies. Access rates vary considerably across the emerging and developing nations surveyed. Two-thirds or more in Chile (76%), Russia (73%) and Venezuela (67%) have access to the internet, as do six-in-ten or more in Poland, China, Lebanon and Argentina. 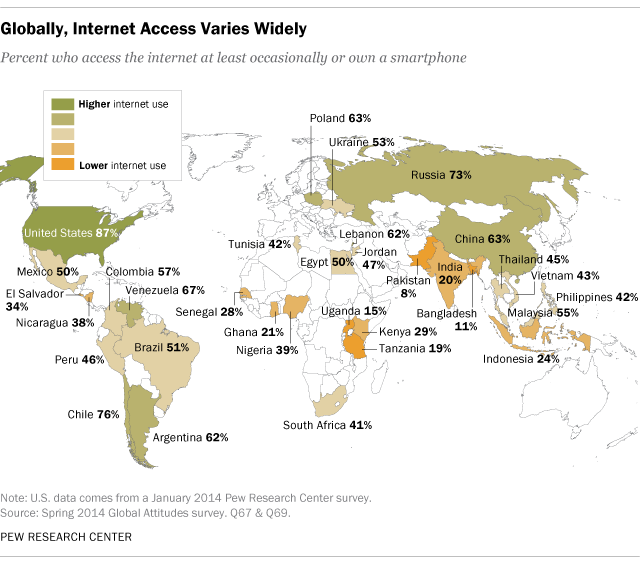 Yet less than half in Vietnam (43%) and the Philippines (42%) have internet access. And in nations that are less economically developed, such as those in sub-Saharan Africa, internet access rates lag even further. Toward the bottom in terms of access rates are some of the world’s most heavily populated nations in South and Southeast Asia. These include Indonesia, where only 24% of the population has access to the internet, India (20%), Bangladesh (11%) and Pakistan (8%). Combined, these countries account for approximately a quarter of the world’s population. Across the emerging and developing nations surveyed, internet access is closely linked to national income. Richer countries in terms of gross domestic product per capita have more internet users among the adult population compared with poorer nations. Additionally, within countries, internet usage is more common among young people, the well-educated and those who have the ability to read or speak English. People with a secondary education or higher are significantly more likely to use the internet than their less educated counterparts. Similarly, those who have some English language ability are more likely to use the internet, even accounting for differences in education. Age also impacts whether someone uses the internet – older people are less likely to report using the internet than their younger counterparts. For example, 70% of young Vietnamese (18-34 years old) use the internet, while only 21% of those age 35 and older do. And three-quarters of Vietnamese with a secondary education or higher have access to the net, while only two-in-ten with less than a secondary education do. A similar gap appears for Vietnamese who can speak or read at least some English (83%) versus those who cannot (20%). In addition to these factors, having a higher income, being male and being employed have a significant, positive impact on internet use, though to a lesser degree. Among people in emerging and developing nations who have access to the internet, nearly two-thirds (a median of 66%) access it daily. And among internet users in those countries, a median of 82% use social networking sites, such as Facebook and Twitter. Majorities of internet users in every country surveyed say they use social networks, ranging from 93% of internet users in the Philippines to 58% in China. And while social networkers are found in all age groups, they are more likely to be under the age of 35. Along with social networking, an equally popular use of the internet is staying in touch with friends and family. A median of 86% of internet users across the emerging and developing nations surveyed say they have used the internet this way in the past year. While not as popular as socializing, many internet users also like to access digital information, whether it is political (a median of 54% among internet users), medical (46%) or governmental (42%). Getting online political news is particularly prevalent in Middle Eastern countries, like Tunisia (72%), Lebanon (70%) and Egypt (68%). Utilizing the internet for career and commerce is a less popular activity. Among internet users, medians of less than four-in-ten say they look and apply for jobs (35%), make or receive payments (22%), buy products (16%) or take online classes (13%). In certain countries, these professional and commercial online activities are more common. For example, 62% of internet users in Bangladesh and 55% in India say they have used the internet to look for or apply for a job. In China, home to internet commerce giants such as Baidu and Alibaba, 52% of internet users say they have purchased a product online in the last year. In keeping with the socializing preference of internet users, people on social networks are apt to share information about popular culture, such as music, movies and sports. Men are more likely than women to share sports news with their family and friends online. Sharing information about personal views regarding religion and politics and purchases is less common. 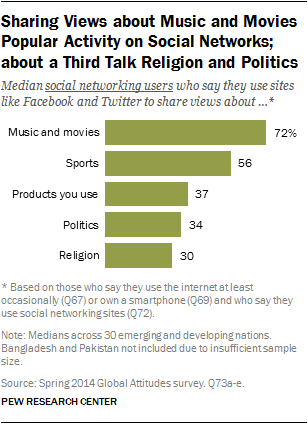 Less than four-in-ten social networkers in emerging and developing nations say they share views about products (37%), politics (34%) and religion (30%). But there is a range of interest in debating these topics online, from the 8% among social networkers in Russia and Ukraine who discuss religion to the 64% in Jordan who say the same. Similar ranges can be found for sharing views about politics and products on social networks. In several of the countries surveyed, sizeable percentages access the internet from devices other than a computer in their home. Across the 32 emerging and developing nations, a median of 38% have a working computer in their household. In 10 countries, computer ownership is roughly two-in-ten or less. By contrast, 80% in the U.S. and 78% in Russia have a computer in working order in their house. Cell phone ownership is much more common in the emerging and developing nations surveyed. A median of 84% across the 32 nations own a cell phone (of any type), not far off from the U.S. figure of 90%. Mobile ownership rates range from 97% in China and Jordan down to 47% in Pakistan. But smartphones – and the mobile access to the internet that they make possible in some locations – are not nearly as common as conventional cell phones. A median of only 24% say they own a cell phone that can access the internet and applications (See Appendix B for a full list of devices in each country). In the U.S., 58% owned a smartphone as of early 2014. These cell phones and smartphones are critical as communication tools in most of the emerging and developing nations, mainly because the infrastructure for landline communications is sparse, and in many instances almost nonexistent. In these emerging and developing nations, only a median of 19% have a working landline telephone in their home. In fact, in many African and Asian countries, landline penetration is in the low single digits. This compares with 60% landline ownership in the U.S. Cell phones also have the added benefit of being capable of more than just vocal communication. Among cell phone owners across the 32 countries, 76% use text messaging via their phones. This is similar to the 83% of cell owners in the U.S. who text. And an additional 55% of mobile owners in these emerging and developing nations use their phones for taking pictures or video.